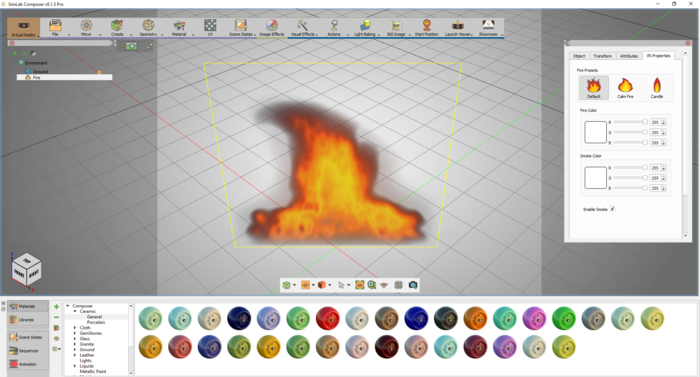 Create Fire: Create fire from various presets and control its color and smoke for stunning visual effects in your VR scenes and projects. 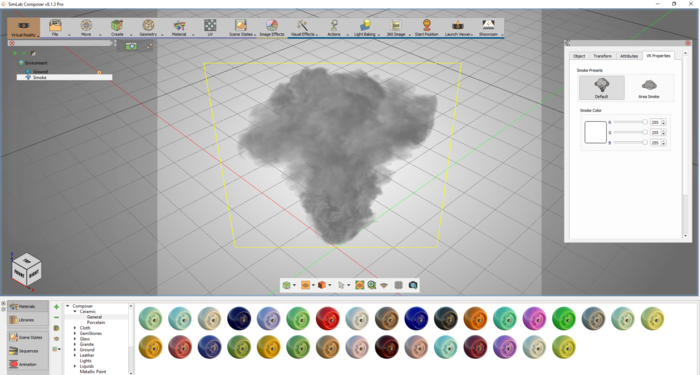 Create Smoke: Create smoke from various presets and control its color for stunning visual effects in your VR scenes and projects. The fire effects let you create geometry that is camera-aligned. The objects always align to view default or connected camera. The plane geometry linked to the fire effects will rotate around the local Z axis to face the viewer. The fire effects are centered on the object (plane) which is linked to it. Go To visual effects menu » Click the Create fire button on it. When setting the fire source for VR, the user has options for choosing the fire presets and choose (fire/smoke) color. Fire is always kept aligned with the camera. In object tree you will notice that the shape of the icon has changed to the fire shape. The Smoke effects let you create geometry that is camera-aligned. The objects always align to view default or connected camera. The plane geometry linked to the smoke effects will rotate around the local Z axis to face the viewer. The smoke effects are centered on the object (plane) which is linked to it. Go To visual effects menu » Click the Create smoke button on it. When setting the smoke source for VR, the user has options for choosing the smoke presets and choose a smoke color. In object tree you will notice that the shape of the icon has changed to the smoke shape.